author of several books including Crochet Saved My Life and Mandalas for Marinke. Setting and meeting goals offers us a lot of personal benefits. It gives structure to our days, provides a focus for our time, adds meaning to our activity and improves our self-esteem. On the flip side, some people use goals to beat themselves up, and when we don’t meet our goals it feels like a broken promise to ourselves that can be hard to get over. It can be helpful in our lives to practice setting goals in areas that are emotionally low-risk, easy and comforting. Crochet is a great place to work on goal setting. The first step is to take time to ponder what goal you want to set in crochet. The important thing is that the goal is something truly meaningful for you, aligned with your personal values, and feels achievable. If you set a goal to crochet every day but this isn’t feasible with your lifestyle then it’s not the right goal. If you set a goal to crochet more for charity but deep inside what you most want is to craft for yourself then it’s not the right goal. Take the time to consider the goal carefully. You might engage in some meditative crochet to help you focus on finding your goal. Journaling or taking through it with a friend are other ways to mull through goals and pick the right one. Try to brainstorm a list of all possible crochet goals, including ones that you've stated explicitly to yourself or others and ones that you've only had as passing thoughts (such as designing a pattern for a magazine, going on a crochet retreat or even - gasp - never crocheting again). Cross off all goals that don't resonate with your heart. Look at what's left and really dig deep to see whether or not those are the right goals for you, why you want to accomplish them, what you want from doing them. Envision yourself completing that goal and imagine how that feels; is that the feeling you want? 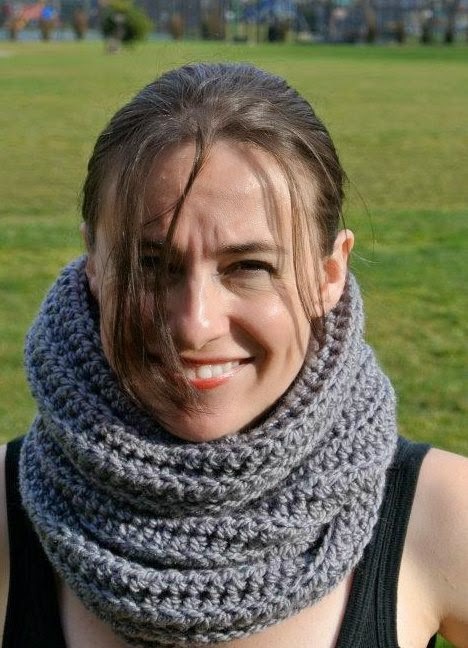 What Are Some Goals in Crochet? Learn how to crochet a new stitch, technique or pattern. Crochet more items for charity. Write down the big, overarching goal. Make sure that the goal is clear and includes the reason why this goal matters. For example, "I will crochet every day because it is good for my health" or "I will learn how to crochet broomstick lace because I want to prove to myself that I'm capable of something that seems difficult to me". Having the reason helps you stick with the goal when you're in the rough middle part and can't remember why you thought you'd bother with this. A goal is easiest to meet when you can measure it. Instead of "I will crochet every day" you might choose "I will crochet 30 minutes per day every day for one month" or "I will crochet one flower per day for one year". Make the goal challenging but not impossible. You can always add to it later. What are each of the things that you need to do in order to meet the goal? You may need to buy specific supplies (a dowel for broomstick lace, enough yarn for daily crochet). Then you might need to set aside specific time for your goal. There might be places where you can mark milestones - after each arm of a sweater, for example - or after ten rows of daily crochet. Ask yourself, "what actions must be taken to meet this goal?" There will inevitably be some way in which you don't meet your goal. This is when that self-doubt can creep in and mess the whole thing up. Before you even begin working on your goal, write down a mantra or two to refer back to at this time. "I will start again tomorrow." "Progress is better than perfection." "I can achieve this goal. I will make one step right now." These are all things that can get you moving forward on your crochet goal instead of moving back. Do whatever feels good to you to celebrate when you meet your goals - and even when you meet the smaller steps within a goal. Goals are good for us when we feel good about them. Celebrating enhances that feeling. Share your achievements on social media for that boost of support from your crochet community! Many thanks to Kathryn for sharing her tips with our readers! Be sure to check out her blog for great crochet tutorials, awesome collections of free crochet patterns, art, fashion and more! 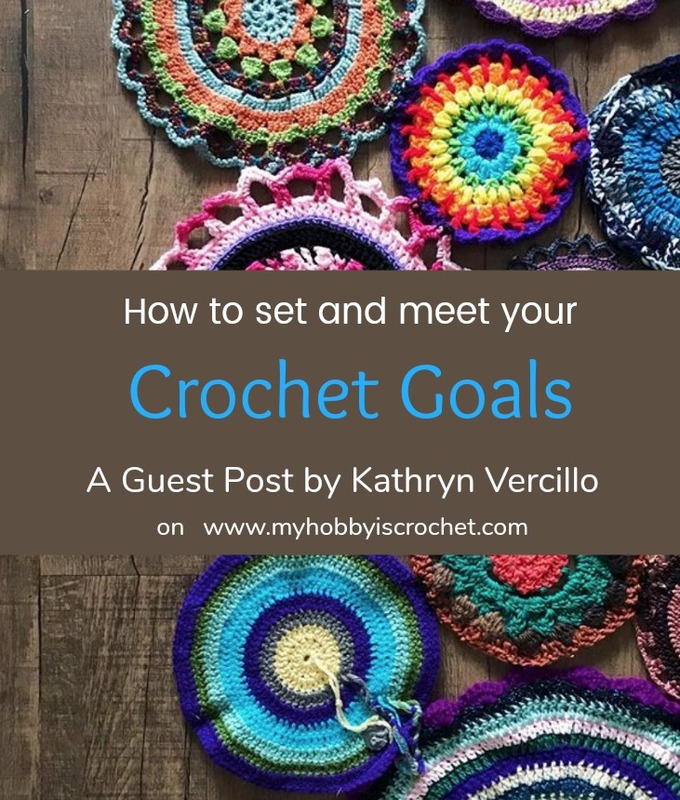 Kathryn Vercillo, blogger at Crochet Concupiscence (Simply Crochet) and author of several books including Crochet Saved My Life and Mandalas For Marinke . You can support her work with microdonations through Patreon.